Canon Professional Services (CPS) is the photographic equivalent of an airline Frequent Flyer Programme - a frequent Canon buyer programme, if you will. (Nikon have a similar scheme). If you own the requisite number of qualifying Canon lenses and bodies (mainly pro cameras and L-series lenses) then Canon will give you priority repair treatment and loan you equipment while your own is out of action. And that was pretty much it. Until recently when Canon introduced CPS+. CPS+ is a programme of photography events at which members of CPS are invited to spend a day photographing, listening to talks by Canon-sponsored pro-photographers and trying out new equipment. All free of charge. 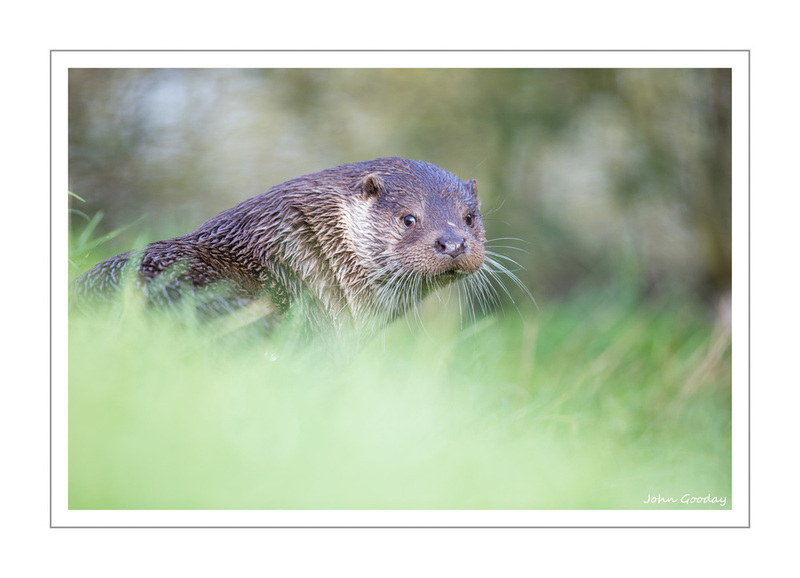 Last week I went along to a CPS+ wildlife photography day to see what it was all about. My invitation included a 'plus guest', so I took along the depressingly talented John Devries (of www.ophrysphotography.co.uk), a long time co-conspirator. When I pulled into the car park at the British Wildlife Centre in Surrey, which Canon had taken over for the day, my heart sank at the number of other cars already there. I needn't have worried. Although there were well over 50 guests, Canon had arranged for us to be split into 6 separate groups for the activities, so overcrowding during the shooting sessions wasn't a problem. Danny Green and Mark Sisson were the two wildlife photographers fronting the event. Both gave excellent talks about their work during the day and could be seen wandering around dispensing advice during the practical sessions. I was left marveling at how Danny could still talk happily about puffins even after taking 1.2 million photographs of them for a National Geographic assignment. In the morning we all attended four shooting sessions back-to-back: otters, red squirrels, wild cats and foxes. The British Wildlife Centre staff accompanied us into the enclosures with the animals and lured them into the open with fish/nuts/chicken pieces as appropriate. I was glad I'd packed a set of waterproof trousers for crawling through the wet grass (even more so when I crawled through a pile of wildcat droppings while trying to get a shot - I guess that's suffering for your art). Canon had bought along plenty of lenses and bodies for people to borrow during the shooting sessions. Dozens and dozens of big white super-telephotos, (including many copies of the the latest 500, 600 and 200-400mm L-series monsters), pro cameras bodies and even monopods for people who had managed to leave their tripods at home. True to form, I managed to request the only lens that they hadn't bought along - a 200mm f/2, but, to be fair, it's not what most people would think of as a wildlife lens (I like to be different). I was also slightly disappointed that they didn't have any copies of the new 7D Mark II, which starts shipping this week - it would have been nice to see how it performed, and I'd have thought that a lot of the people at the event were potential buyers of the product. That said, there were several hundred thousand pounds worth of shiny toys to borrow, so you couldn't accuse Canon of being mean. After lunch we got to photograph four different kinds of owl in natural settings, and then one session of flight shots with a barn owl. All good fun. The thing that surprised me most about the day was the lack of hard sell - I'd expected talks about Canon equipment, sales offers etc. In fact, Danny and Mark briefly mentioned that the 1DX was quite good, and that was it. All in all, a nice day out, well organised by Canon. If you get an invitation to attend a CPS+ event, I'd definitely recommend going along.